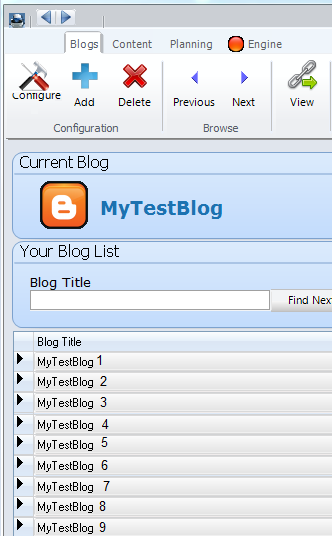 Welcome to the Best Blogging Software on the Planet! Few things on the Internet are as hot right now as blogs. At last count there were well over 100 million blogs and that number is rapidly rising every day. The growing popularity of blogs naturally leads entrepreneurs such as you and I to ask - So how can we make money from this phenomenon... without having to write every day? You've heard the term black hat? It refers to those underground, borderline illegal or just plain illegal techniques and programs that the "bad guys (blackhatters)" use to make a financial killing online. Well, let me assure you there is nothing illegal about BlogHatter ... though people who don't own the program are sure to start screaming that it must be illegal once they start seeing the profits it produces. So what exactly is BlogHatter? It's a cutting-edge software program that allows users to create high-quality blogs in a mere matter of minutes. The simple truth is thanks to this incredible software program it has never been easier to create passive-income-producing blogs that contain images, relevant videos, high-quality content and much more! 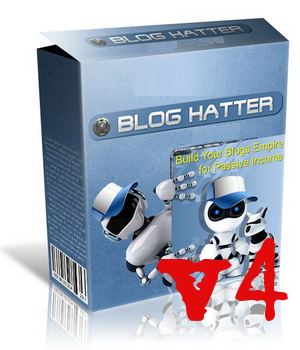 BlogHatter is NOT a Black Hat Tool ... It Just Produces Results (i.e. Cash)! You will be able to work with your blogs in less than a minute. 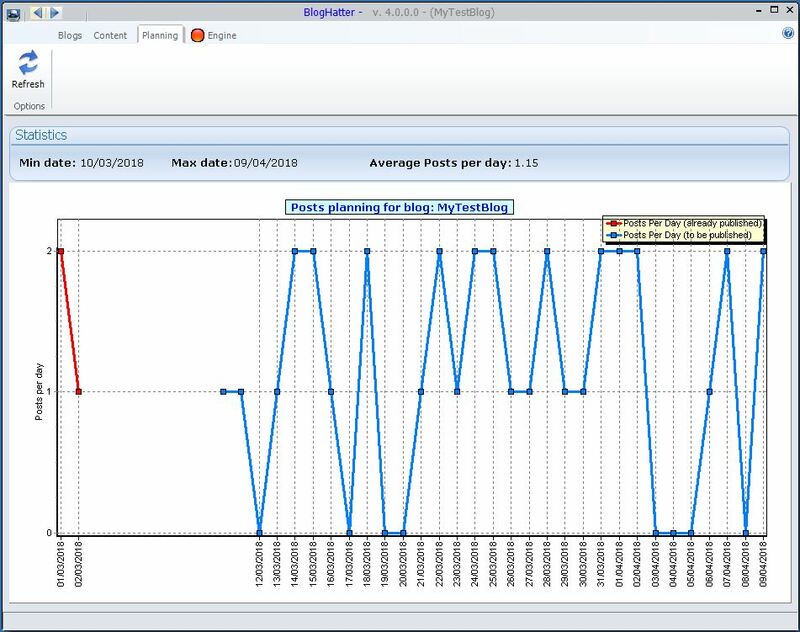 Ability to schedule posts on a random basis without having to deal with things like cron jobs or setting up scripts! 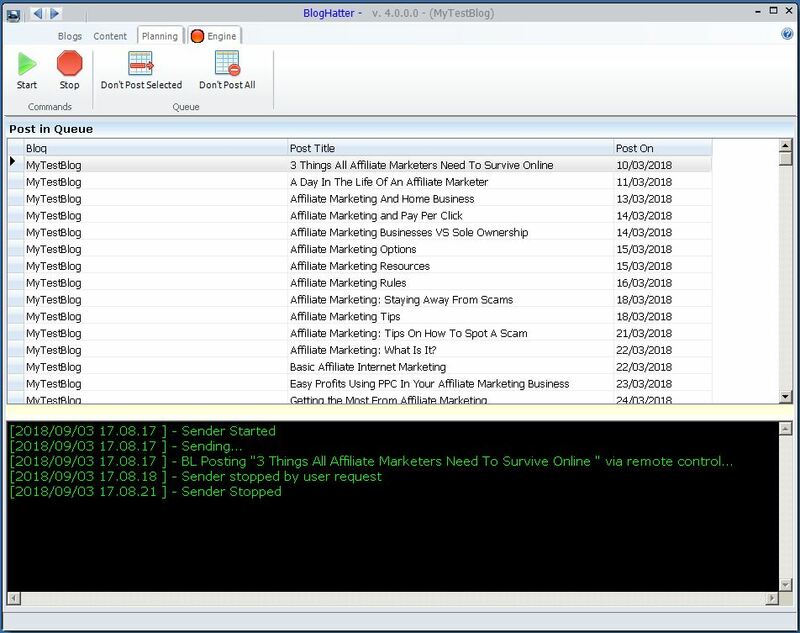 You don't even have to go near Cpanel when using BlogHatter. Do you have 100 blogs? No worries, BlogHatter is able to manage all of them. Import articles from files: do you have tons of PLR articles on your hard-disk. Put them into your blogs with just one click! Improve the perceived quality of your blog by importing images and video! 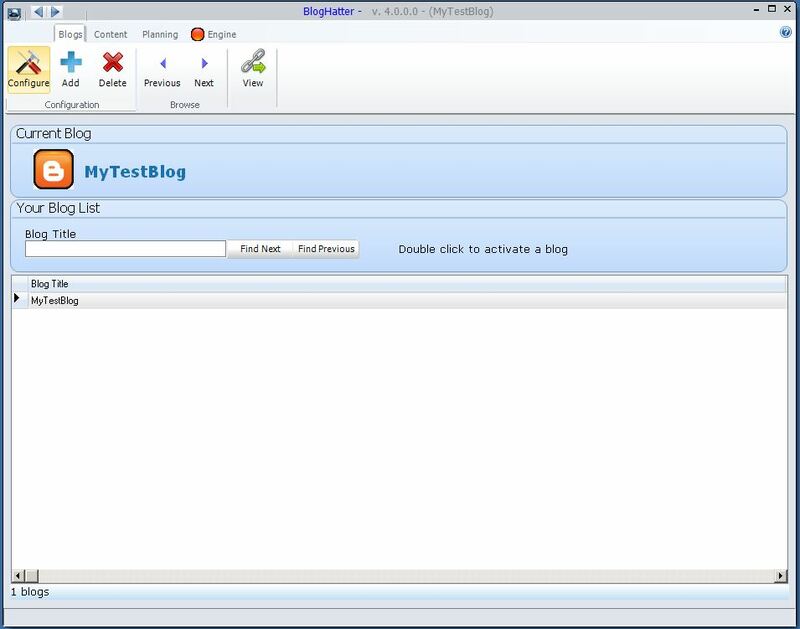 BlogHatter allows you to search and import videos from Youtube without leaving the software BlogHatter will allow you to put images from your hard-disk: BlogHatter will automatically upload the images onto your blog via FTP or using the inbuild upload functionality of Wordpress. Replace keywords with your synonyms, replace keywords with links, add any kind of text (supports spintax), remove links, images, text, script... The Replacement Tool is awesome. Make REALLY UNIQUE content using TheBestSpinner API. Yes, BlogHatter supports TheBestSpinner API! 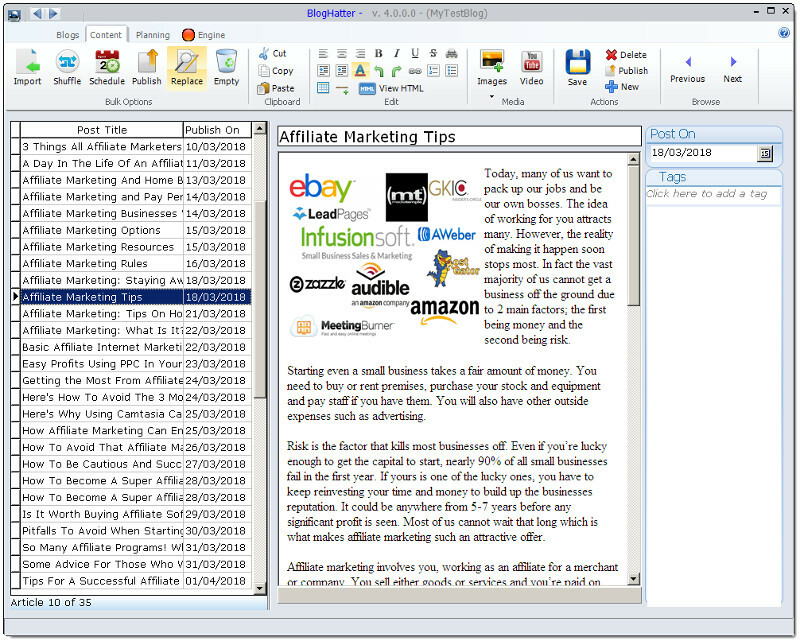 Automatically rewrite your articles using this amazing technology. "...I use it and it's worth every cent and much much more." If you're a blogger Buy It! If you can't afford it and you want to make more money from blogging than you have so far, sell some junk lying around your house and spend the money on this. Go without a meal and buy it. If you spend money getting people to do stuff for you and you're a blogger, buy it and sack them. If you're serious about making money online, this is a tool that will help and it's quick and easy. If you're considering outsourcing some of your blogging work buy this first and then decide whether you still need to employ someone... and if you do, you can get them to do more productive stuff like getting backlinks because you won't need anyone to do the posting, scheduling etc. I use it and it's worth every cent and much much more. Treat yourself to a Christmas present that will pay for itself over and over again. "Any blogger should have this mighty weapon in their arsenal!" After beta testing Bloghatter for two weeks, I'm glad to give you my honest testimonial: this is an awesome program that is going to save every serious blog marketer a whole lot of time and effort. I've been able to put together four (4) different new blogs in one evening, complete with all the dozens of blog entries for the next four months for each blog! Each of these entries exists of PLR-materials that I edited in the process. Bloghatter makes it simple to change headers and text parts; search for images from various sources, and add these instantly; search for Youtube videos and add these, too; put links in the text, and add tags to every article. This goes for Blogger and Wordpress blogs. Any blogger should have this mighty weapon in their arsenal! Any blogger should have this mighty weapon in their arsenal! It's a really cool instrument! "...I have even recommended it to my Members"
What can I say, I have been a BlogHatter fan for quite awhile now and I have even recommended it to my Members. The best thing though is what this product does for me personally. I use BlogHatter almost daily to quickly upload and schedule numerous articles for my blogs. 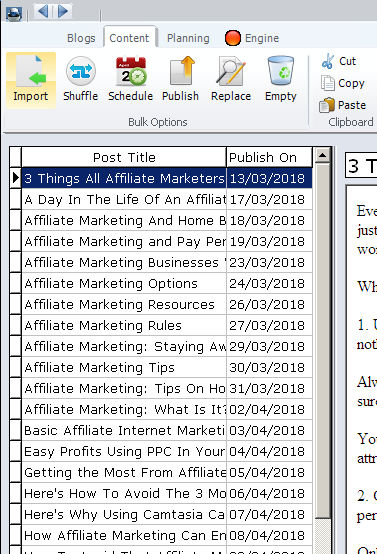 There is nothing like the simple way this software gives me the flexibility to do almost anything I want with an article and then uploading it to any of my Wordpress or Blogger blogs. All I can say is thanks and can you please hurry up on the upgrade? I can't wait to see what else I will be able to do with the added Spinning capabilities. Thanks again. "...everything works now and I really appreciate the customer support"
Hi Donato You are a genius, everything works now and I really appreciate the customer support you gave me and you guys were on top of it each and every problem I had in configuring the software 'BlogHatter'. I will recommend any one to your products and I will make sure to tell all of my friends about your software and the excellent customer support. Please keep me posted of any other software you create. I really appreciate the time and effort you took in responding to each of my problems and if I have any other questions I'll make sure to keep you posted. "...You have proved to not just promise support but actually deliver it"
G'Day Donato, Thanks for all your help. You have proved to not just promise support but actually deliver it. Despite the fact that my problem was unique to my circumstances you have still worked hard to provide a solution. It probably would have been much easier to just give me a refund and tell me to go away but you didn't do that. This shows me that you are really focused on providing quality customer service and that you really want everyone who buys BlogHatter to be able to get the considerable benefits of using it. "...No longer tied to my desktop"
Thank you for your program, it has made updating my numerous blogs (both blogger and wordpress blogs) with new content so much easier. Being able to add pictures and/or video with just a click of a button is so simple. Scheduling when my articles will publish means I am no longer tied to my desktop every day, I just set up the schedule to upload my articles for the week and let it run. I would highly recommend your program to anyone with a blog. No Monthly or Yearly Membership Fee! 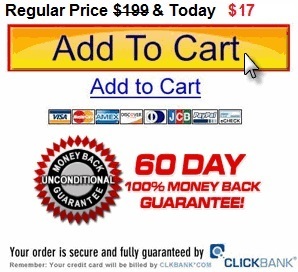 15,000 Private Label Articles yours for FREE to start Blogging right now! COPYRIGHT © BLOGHATTER.COM . ALL RIGHTS RESERVED.